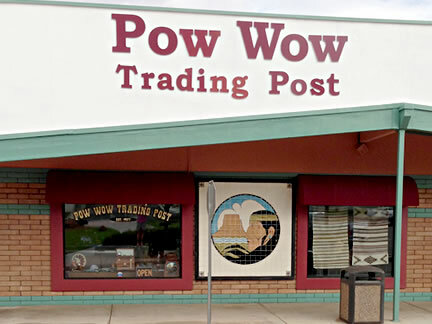 Pow Wow Trading Post in Page, Arizona, which borders the Navajo Reservation, has served the local Native Americans since first opening in 1977. It has also blessed us with a tremendous variety of jewelry, and art from the local vendors and artisans. 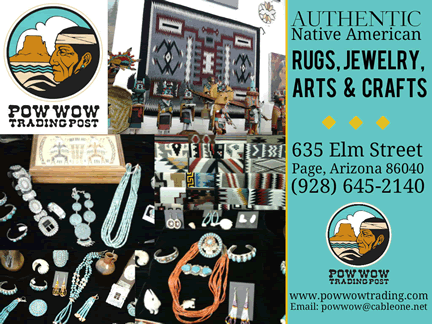 Our mission is to bring to you, our customer, authentic Native American pieces. You have our guarantee. Because of the type of merchandise that we sell, it is rare that we will carry multiples of certain items. We also offer many ceremonial items, music, T-Shirts, Pendelton blankets, and a large variety of other Native American goods that unfortunately are too many to list. Indian owned and operated. Please stop in and see us if you are ever in our area!